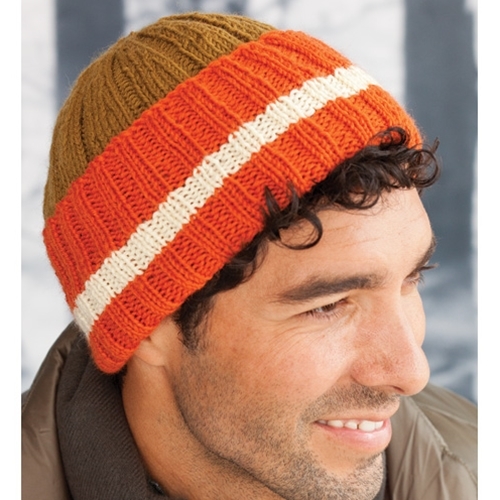 A ribbed tricolor watch cap is striped on the doubled brim, solid at the crown. Sized for Child, Adult Woman, Adult Man. Shown in size Adult Man. * Due to the elasticity of ribbing, the finished circumference measurement is much smaller when the hat is laid flat and slightly stretched. It will stretch to fit when worn. • 26 sts and 30 rows to 4"/10cm over k2, p2 rib (slightly stretched) using smaller needles. • 24 sts and 28 rows to 4"/10cm over k6, p2 rib (slightly stretched) using larger needles.